A year ago today was the first Monday I wasn’t on a plane to Kentucky for the week since before Valentine’s Day. A year ago today was my first day back to work after spending the week with my brother following he massive heart attack. A year ago today thousands of people lined up for my ‘hometown marathon’, and hundreds of thousands lined the streets for the Patriot’s Day tradition. A year ago today an unbelievable tragedy struck as two bombs were detonated at the finish line of the Boston Marathon, shattering lives and a city and a community. A year ago tomorrow, thousands of runners got up and ran a memorial run for Boston, for those who died, were hurt, had their lives changed forever. We could not undo the tragedy, but we did what little we could. And every day since, millions of runners have hit the roads and shown that while horrible actions can shatter lives, the human spirit will always prevail. We can never truly stop those seeking to do evil or inflict violence, but we can stop them from controlling our lives. So today I run again, and I run for Boston, for the lives lost, the lives shattered, the lives changed, and the city and community that persists. 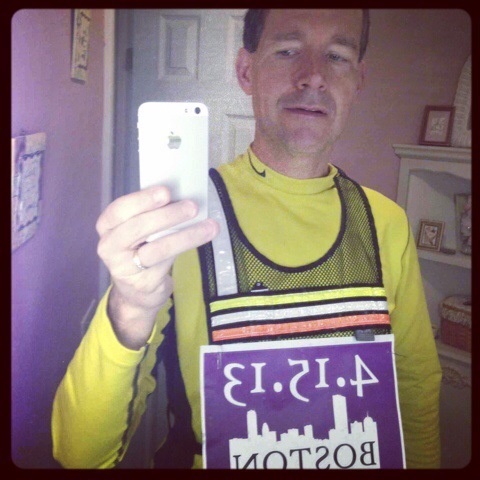 This entry was posted in Running and tagged Boston by txa1265. Bookmark the permalink. A very poignant memorial. This hit us at our core and we will never forget. So very true – it is one of those moments where you didn’t need to be from Massachusetts or be a runner … you just needed to be human to feel the impact. I think any miles we log in an intentioned way like this can only bring more good things to the world. :Beautiful tribute. Thank you for well put reminder of the significance of today. . This is beautiful, thank you for the reminder. Awesome – good luck and enjoy! Very nice! I made it a point to run today too!